One of the fun things to do as part of the Thirty Days project is to revisit locations I have photographed in the past, which is what I did on Day 10 of Thirty Days 2017. Heading to City Park I walked past the common places to photograph as well as locations I have captured in the past in different seasons. 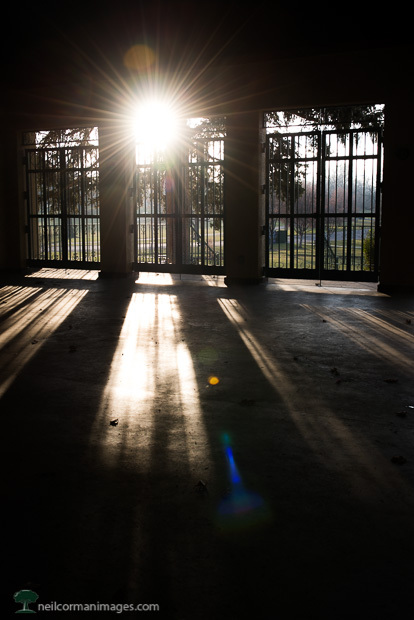 When I approached the City Park Pavilion I noticed the sunlight streaming through and worked to capture this image through the pavilion prior to the sun setting over the mountains. It has been a while since I have walked past the location of the new Kirkland Museum of Fine and Decorative Art. On Day 9 of Thirty Days I was surprised at how much it has changed on Bannock in the past few months. The exterior of the museum caught my eye and I explored it with my camera for quite some time, but it was the straight on view which I liked today. 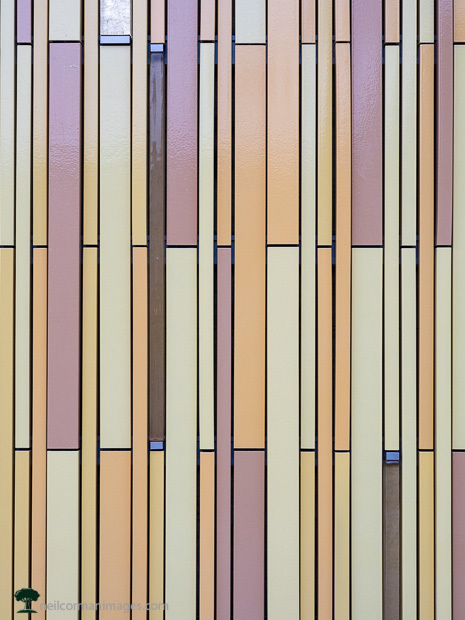 I am sure when the light hits the exterior throughout the year it will produce different results. The new location of the Kirkland Museum will open in March 2018. For the most part the leaves have fallen from the trees in the Denver area, however there are still some trees with color and on Day 8 of Thirty Days 2017 I came across a few of these. Getting close to the tree the challenge today was the wind providing some motion. 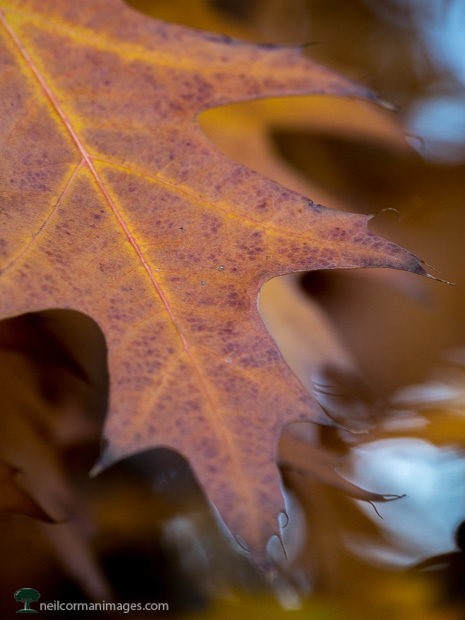 I played with using the motion in the image but for a little while it became calm for this close up of the color of the leaf. I have mentioned in the past there are many indicators of Denver being the Mile High City, but the one most known is on the steps of the State Capitol. On Day 7 of Thirty Days 2017 as I walked by the capitol I noticed a puddle on the steps and the reflection being cast when standing in one position. 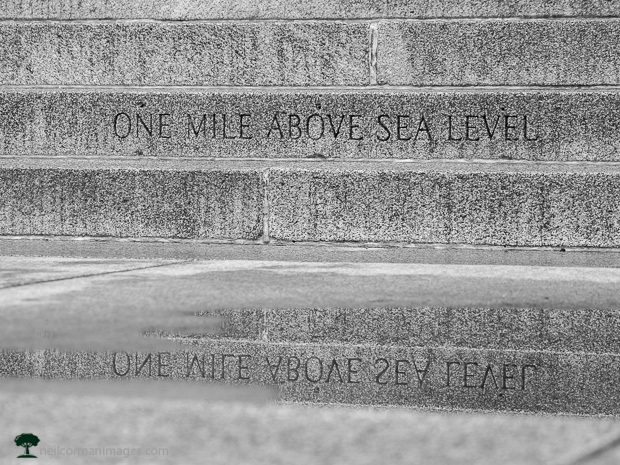 The puddle was in a perfect spot to frame the steps with the reflection of the step stating “One Mile Above Sea Level”. 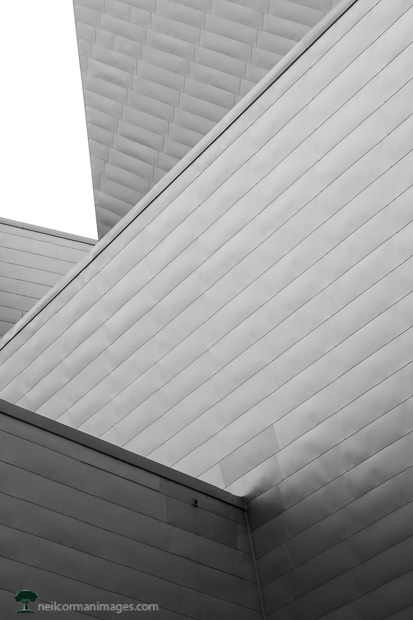 I have probably walked past the Denver Art Museum over 100 times and on a dreary Day 6 of Thirty Days 2017 I once again walked by this building. As I was photographing in the area with overcast skies I noticed a view of the museum I had not captured in the past. The intersecting lines of the building caught my eye here with a small portion of the sky on this morning. 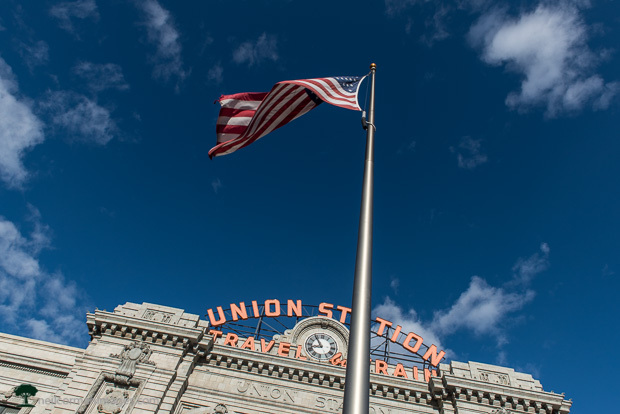 It has been a while since I went to the Union Station area with my camera thus on Day 5 of Thirty Days 2017 I headed to lower downtown. As I walked down 17th towards Union Station I noticed the sun was heading right down the street and lighting the building directly. Positioning myself in front of the of the flag post on Wynkoop Street I pointed my camera upward and captured the flowing flag with the facade of the building. Today is the latest sunrise of the year in Denver. Sunrise was at 7:32 AM MDT, tomorrow sunrise is at 6:33 AM MST due to the end of Daylight Saving Time. 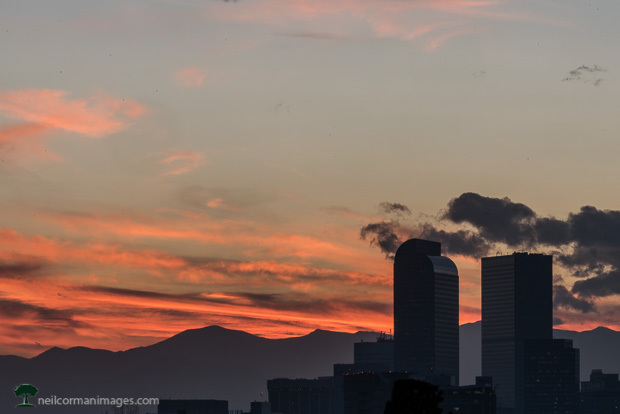 When I arrived at a popular location to photograph Denver I noticed there were clouds to the east of downtown Denver. The key with the clouds is if they are thick are thin clouds which will light up just prior to sunrise. I got lucky this morning with vibrant color for a couple of minutes providing this look of downtown Denver on Day 4 of Thirty Days 2017. This evening while photographing sunset from City Park on Day 3 of Thirty Days 2017 I tried a little different perspective. 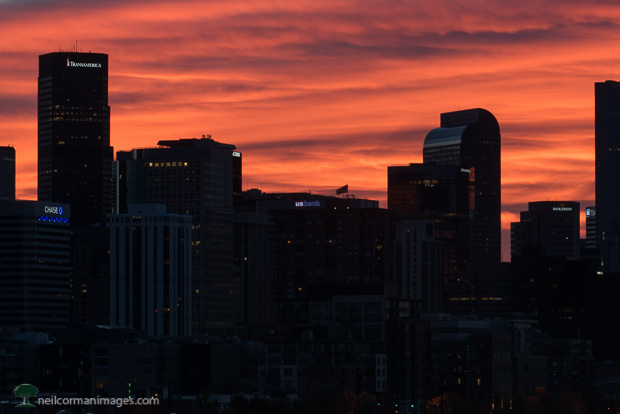 Seeing that there would be some color in the sky at sunset I decided to zoom in on two of the more recognizable buildings in the Denver skyline. Letting them stick up against the mountains and getting some of the color of sunset I positioned the buildings accordingly. While downtown Denver is some distance from the mountains, the longer lens helps compress the scene of the Mile High City. 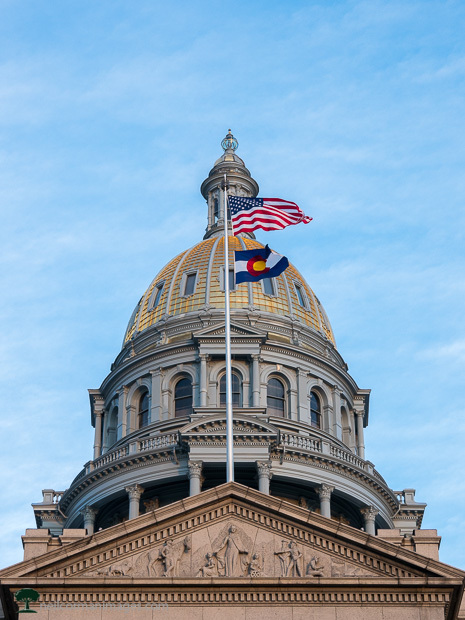 The past few years there has been construction occurring at the State Capitol of Colorado, and there still is ongoing on the north roof of the building. However it is possible to get a view of the dome without the work obstructing the view these days. A couple of months ago I had the opportunity to go on a tour of the building and climb the steps all the way to the glass ball at the top of the dome. It is a tight fit to get up there but it is definitely a different perspective none the less. This image was taken just prior to sunset on a nice November day in Denver for Day 2 of Thirty Days 2017. As I was walking through Denver in the late afternoon of Day 1 of Thirty Days 2017 I noticed how the afternoon light was casting itself amongst some of the buildings. Near the Denver Library I have always noticed the lines in this building not far away and positioned myself to catch the vertical lines this afternoon with the late afternoon light. 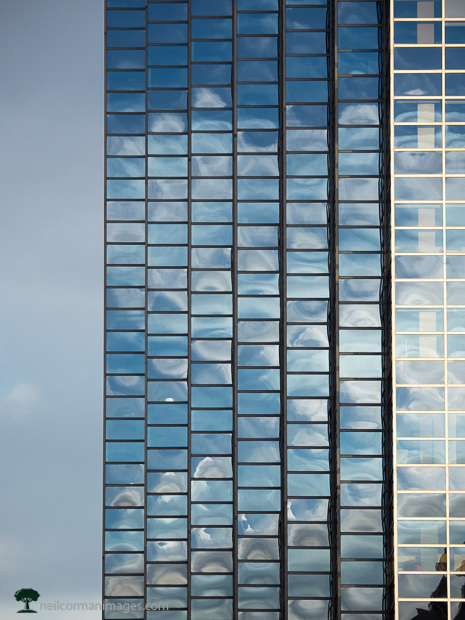 Some of the clouds in the sky are reflecting in the glass and if you look carefully on the right you can also capture some of the insides of the building through the clear glass.